I spent a while working on the arrangement of this set as it proved decidedly tricky to get the diversity of tracks to flow together into some sort of coherent whole. Still I’m happy with the outcome. Enjoy! A friend was visiting a few weeks ago and brought in his M-audio Torq Xponent in for me to have a mix on. I enjoyed my self so much over the next 24 hours that I went and got myself one. 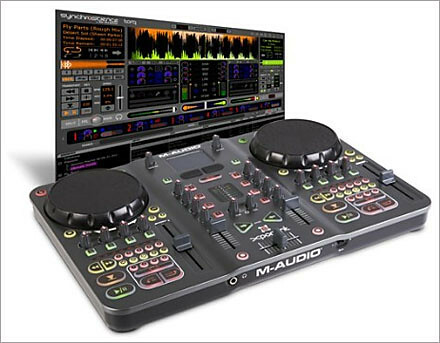 I had been having some problems with my existing system a M-Audio external Audiophile sound card and Virtual DJ software. The Audiophile sound card with ASIO drivers crashed way too often to be performance worthy. The pitch would drop and the sound would start distorting, usually as a second track was added to a mix. The Xponent includes a two channel sound card so I wouldn’t have to worry about using the crappy on board Ac97 sound card for the headphone channelas an added bonus of upgrading. Having had the system for a couple of weeks now using the included Torq mixing software I have been pretty happy with the results. The Torq software still seems to have a few problems and has crashed a number of times, which is a few times too many. The software is a year on and up to V1.04 so they are addressing problems – but more to resolve. I don’t have 100% confidence to play live with it at this point in time, but I hope that will change by the next version. I have set up a dedicated 3 GB partition on my mobile desktop, a Clevo D900k, with WinXP SP 2 and all Windoze updates installed. The partition is on a striped RAID array for optimal performance. Base system drivers installed ie. RAID, AMD processor management, as well as WiFi for Windoze updates. All unnecessary Windows components have been uninstalled and I have disabled any service (see this post) that isn’t going to be required. There are a lot that you do not need for DJ’ing and diasbling them can give any computer a performance boost.